With defence cooperation with India on the rise, Russia is now ready to take on the role of the main arms exporter for other BRICS countries. 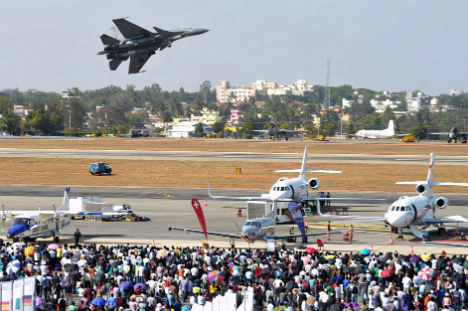 Last weekend in Bangalore saw the close of Aero India 2013, the largest international aerospace exhibition to be held in Asia. But it failed to serve up any new contracts for Russia's military-industrial complex. Despite that, Rosoboronexport (ROE) announced that military-technical cooperation with India, Russia's most important (in this context) strategic partner in Asia, was only moving in one direction, upwards. Deputy Director General of ROE and head of the joint delegation of Russian arms manufacturers in Bangalore Viktor Komardin, noted in particular that a contract to supply India's Ministry of Home Affairs (MoHA) with 12 Mi-17V-5 helicopters was already on the table. “We are expanding our markets, and are about to put pen to paper with India's MoHA,” Komardin told journalists. “It was delayed slightly due to bureaucratic reasons. But the contract is ready: initialled and reviewed. Besides the Indian Ministry of Defence, the Russian Ministry of Internal Affairs is also a customer, he said. Moreover, Russian helicopter manufacturers are confident that the Ka-226T will win a tender to replace 200 Alouette 2/3 light helicopters, which India uses for intelligence and surveillance, plus a contract for the supply of air-defence systems, in which Russia is tendering the S-300VM (Antey-2500) long-range anti-aircraft system. The system is designed to strike tactical and strategic aircraft, both present and future, including stealth aircraft, medium-range ballistic missiles, tactical and theatre-of-war missiles, aero-ballistic and cruise missiles, as well as radar-surveillance and tracking aircraft, reconnaissance-strike complexes, and signal jammers. Another tender to be held by India's MoHA is for the purchase of patrol aircraft. Russia plans to offer the Be-200 amphibious aircraft. The position is clear in principle. Under the terms of the contract, the first 18 aircraft are to be delivered to India in assembled form, while the remaining 108 units are to be built domestically by India's HAL. In this regard, the winner of the tender was due to invest approximately $5 billion in a new aircraft production plant in India. It is just possible that disagreements have arisen between India and France over volumes, deadlines, and, crucially, the production technologies to be used in the construction of Dassault Rafale fighters on Indian soil. Weapons experts confirm that the last point is the most important. Old-style tenders for the procurement of arms are becoming a thing of the past. The transfer of production technologies to the purchasing country and the creation of joint production facilities are now a make-or-break condition. From this vantage point, the prospects for further military-technical cooperation between India and Russia are good. The BrahMos missile, a joint Russian-Indian project based on a variant of Russian “surface-to-surface” technologies that India acquired last century, is already close to matching the performance of the original “air-to-surface” version, and this summer will see its first test launch from an Su-30MKI fighter. On display this year in Bangalore, for the first time, was India's new fifth-generation fighter, which is being developed jointly by the Russia's Sukhoi and India's HAL (four Russian prototypes of the fighter under the code T-50 are already being tested in Russia). And December last year saw Ilyushin Design Bureau invite a group of engineers and constructors from HAL to Moscow to begin joint work on a new transport aircraft. The only BRICS countries that are not part of Russia's growing military-technical cooperation are China and South Africa, although last fall Russian Helicopters signed an agreement with a major South African defence logistics company to set up a regional centre in South Africa to service Russian military and civilian helicopters (more than 500 are in operation in southern African). The situation with China is more complex. Before the 1990s, all military hardware was exported from the USSR either fully assembled or in the form of knock-down kits that were put together in China. Moscow shared very little technological know-how with Beijing and rarely exported its very latest models. That proved fortuitous. When the Soviet Union collapsed, the Chinese became interested in more advanced Russian weaponry and manufacturing technology (including through intermediaries, such as Ukraine). Soon the country’s annual procurements from Russia alone became worth more than $2 billion. However, the weapons were primarily intended for the eyes of Chinese designers and engineers, who subsequently unveiled tanks, infantry fighting vehicles, fighter jets, multiple rocket launchers, etc., that were strikingly similar to the originals either procured from Russia or undergoing final-stage testing there. The only thing the Chinese could not reverse-engineer were the engines, which is why to this day Chinese tanks are powered by German diesels and Chinese fighters by Russian gas turbines. Russia has effectively refused to sell other components to China since the middle of last decade. However, it is rumoured even among Chinese sources that, if the conditions are right, Russia could resume deliveries to China of entire weapons systems.